After nearly 10+ years of record low interest rates, we have started to see interest rates increase over the past 2+ years. These increased rates have started to put pressure on home buyers and investors in the market. One of the main challenges is that with increased rates, we see lower cash-flows. This further leads to fewer transactions and thus a slow down in the market. We’ve put together some slides to review perception vs. reality in interest rates. In this first slide the left axis consists of the number of sales per 1000 people in the Denver Market. The bottom axis is interest rates. The perception of the media and clients is with lower rates, you will see more sales. Conversely, with higher rates, you will see fewer sales in the market. This seems very intuitive and makes sense that higher rates will lead to fewer transactions and a slowdown in the market. 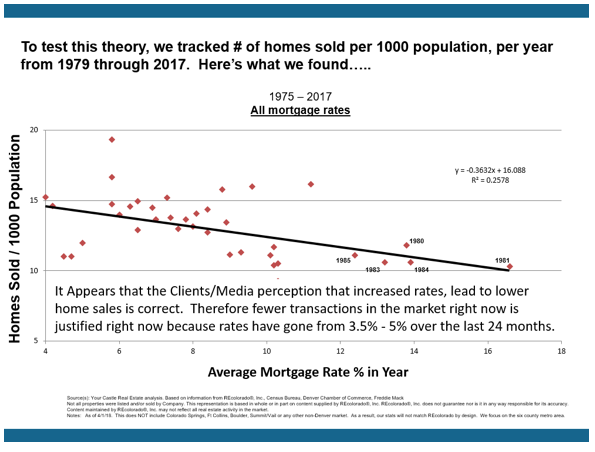 To test this theory, we plotted interest rates vs. # of homes sold from 1975 through 2017. Each year is represented by a red diamond on the following chart. What you see on this chart is a lot of scattered dots (thus it is a “scatter plot”) and it doesn’t give a ton of insight to this question. So after plotting the annual data, we used Excel to plot a TrendLine over this chart. This trendline is represented by the black line in the middle of the chart. And what do you know…. 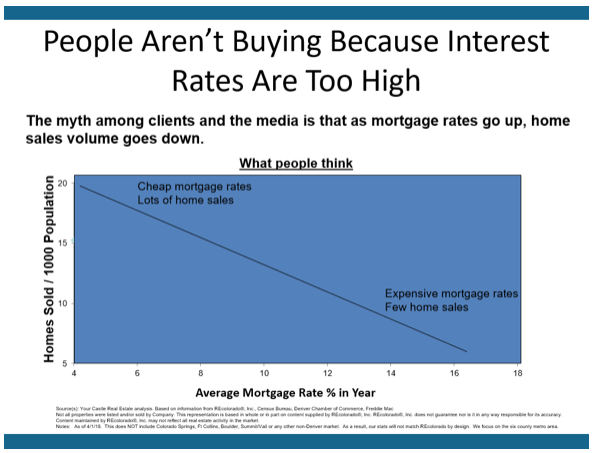 The trend line starts with high # of sales when rates are low and goes down to a low # of sales when rates are high. This mirrors our exact perception that we saw in slide #1. According to this data, it makes perfect sense that sales will have decreased over the past 2 years as interest rates have increased. But that’s not the complete story…. We took this data a step further and thought about some of the extraordinary times in the market over the past 40+ years. The years from 1979 through 1990 interest rates were 10+. We decided to take out those years due to the extraordinary times in the market during those years…. 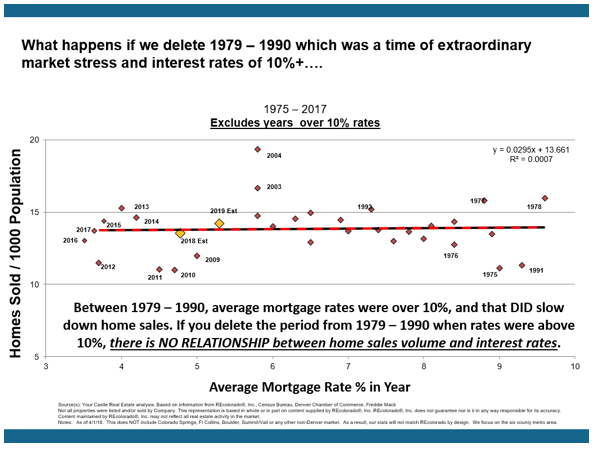 There is absolutely NO RELATIONSHIP between interest rates and the number of homes sales in the market when rates are below 10%. This is shocking to most buyers and investors! However, as a disciplined investor, it is important for us to recognize and understand this data. This indicates that for our exit out of our investment properties, we have no need to be concerned with fluctuations in rates, so long as we are not trying to sell at a time when rates are 10%+.